Among the more miraculous edible transformations is the one that turns raw meat, salt and a few basic spices into some of the most delicious foods around. Time was when curing meat, especially stuffed into a casing to make a sausage, was the only way both to use every part of an animal and to help make it last longer than raw meat. Done right, a sausage would stay good to the next slaughtering season and beyond. The process relied on the skill of the sausage-maker, the help of beneficial bacteria and moulds, the right conditions, a great deal of patience, and sometimes luck. Luck is less of a factor now, because to keep up with demand the vast majority of cured meats are produced in artificial conditions of controlled precision. Here and there, though, the old ways survive. 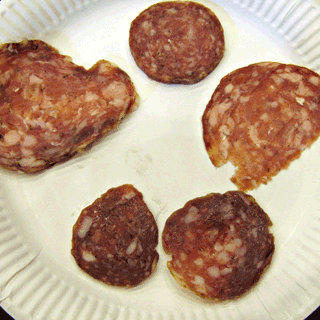 Jan Davison spent months touring the sausage high-spots of Europe looking for the genuine article, and shared some of her favourites at the Oxford Symposium on Food and Cooking last year. Mortadella di Camaiore, from the Triglia family in Camaiore, Italy. Corallina di Norcia, from I Fratelli Ansuini (The Pig Brothers? Surely not.) in Norcia, Italy. Finocchiona di Suino Grigio, from Sergio Falaschi in San Miniato, Italy. I think the Suino Grigio is a cross between the Large White and the fabled Cinta Senese, which almost did for the latter. 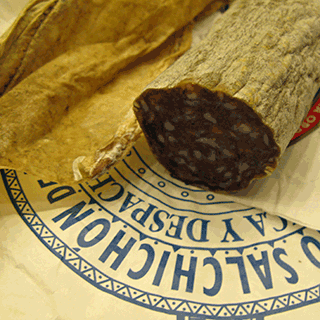 Salchichón de Vic from Casa Riera Ordeix, in Vic, Spain. Lomo iberico bellota – Señorio de Montana, Spain. Along with ham, lomo, cured loin of pork is the highest expression of the curer’s art; especially when it is made from Spain’s indigenous black pig, the Iberico, fattened on bellota – acorns. The loin, left as a single roll of meat almost a metre in length, is seasoned almost imperceptibly with pimentón, (a spicy type of paprika), sea salt, fresh garlic and oregano, before being stuffed into a gut and left to cure slowly over several months. Lomo Ibérico bellota is a cured sausage is to be savoured … slowly; the lomo melts in the mouth releasing complex, nutty flavours. Ahle Wurscht, from Thomas Koch in Calden, Germany. There’s a video of Ahle Wurscht being made, which I had subtitled, but WordPress does not yet permit embedding videos from Universal Subtitles, so you’ll have to just click the link. That video is not from Thomas Koch, although he does have some videos on his site. Jan Davison is writing a book on English Sausages for The English Kitchen series at Prospect Books. All being well it will be published in 2014. Food safety agencies have been very wary about meat cured in restaurants and at home, sometimes with justification. But there really is nothing to be scared of if you take reasonable precautions. A great place to start is at Michael Ruhlman’s blog, and one of his excellent books. I haven’t done so myself, but everyone says Ruhlman is the boss. I am completely indebted to Ellen Pilsworth for translating the German video. Thanks Ellie. Final music by The Bavarian Oompah Boys.
. Trealy farm and Native Breeds are local to me and they produce amazing cured meats and sausages. In this time of economic hardship and mass produced factory foods it is heartening and exciting to see this renaisannce in artisan methods for curing meats. Long may it continue. Tom Nealon liked this on twitter.com.